In some areas around here, there are still probably three to six inches of snow on the ground out here (although I may add that it is quickly melting!). My mind and soul, however, are ready for the spring or even summer! The combination of the cream cheese and raspberry filling in this recipe was such a good tease preparing me for the upcoming warmer months that we all look forward to. While this recipe looks difficult; I can assure you that it is not. 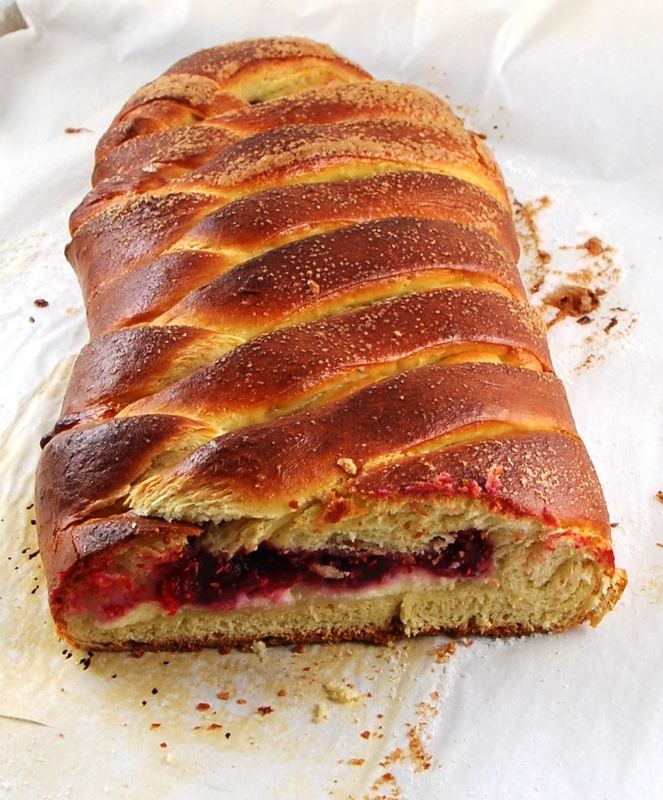 The brioche dough that I used is so versatile that you can modify the fillings to whatever you like, such as different berries (fresh or frozen), diced apples in the fall, or pears in the winter. If you want something savory on your menu, add chopped up spinach, ham, and ricotta… then viola! This is truly a one-stop meal that would satisfy any craving. Thaw your refrigerated or fresh dough, and roll them on floured surface to fit a rectangular 1/2-sheet size cookie sheet. Place parchment paper on your cookie sheet; and transfer your dough. Spread the cream cheese filling on the middle third of your dough. Repeat the layer using the raspberry filling. Make the “braids” by cutting about 1.5-inch apart tabs on each sides of the dough. Alternating the pieces, fold the dough over to cover the filling until it’s all covered. Press gently to seal as necessary. The dough that I used required it to sit and rest for a minimum of 1 hour (if you used other dough, follow its requirement, whether it’s 45 min or 1 hr resting time). After about an hour, glaze the braid with egg wash. Sprinkle generously with sugar. Bake for about 35 min or until golden brown. I would have taken mine a tad bit sooner than 35 min, so start watching the color around 25 min mark. Beat the egg and milk together. Set aside. Mix all of the ingredients together to a boil in a medium-heat. Stir constantly to make sure it doesn’t stick to the bottom of your pot. Then let simmer for about 5 minutes. Set aside, let cool. Mix all of the ingredients together. Make sure the cream cheese is well mixed with the other three ingredients. Set aside. 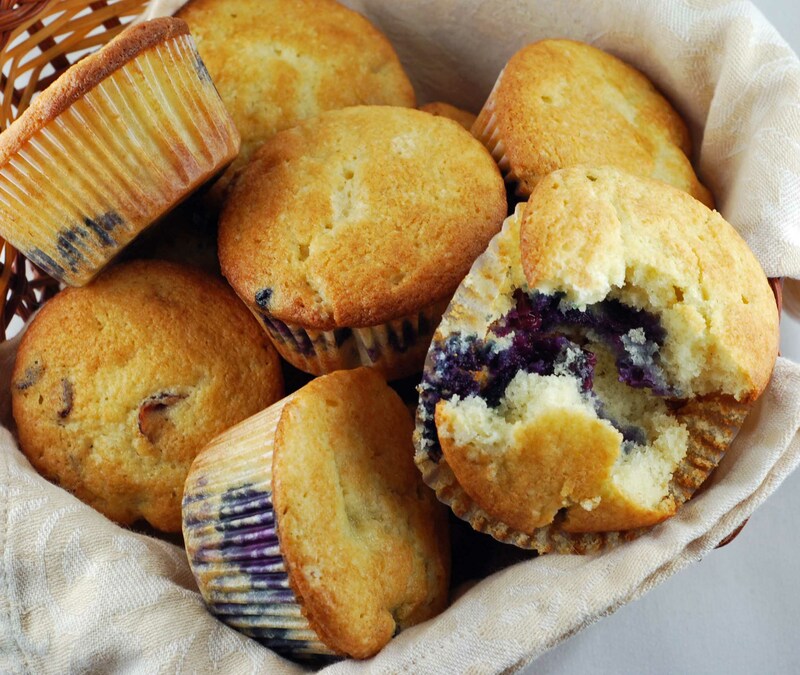 I have been wanting to make these muffins since I first saw the recipe on Barefoot Contessa Family Style. I finally decided to make these to take advantage of the abundance of blueberries this summer. I asked Red if he’d be up for eating these since we haven’t baked anything for breakfast in quite a while, and he said yes (of course, I didn’t expect any other answer, really!). So lo and behold, I woke up this morning with the noise of our Kitchen Aid mixer buzzing in the kitchen. Red was up and started mixing a batch of these muffins! As soon as I got into the kitchen, he said,”Can you put some vanilla into the mixing bowl?” Aah yeah, what a way to start my morning! This recipe received a pretty high review overall on the Food Network and we agree that they were light and wonderful. A couple of things that I did that the recipe didn’t ask for. I rolled my blueberries in about a tablespoon of flour to prevent them from sinking. And I sprayed the muffin pans with cooking spray and used paper cupcakes liner. 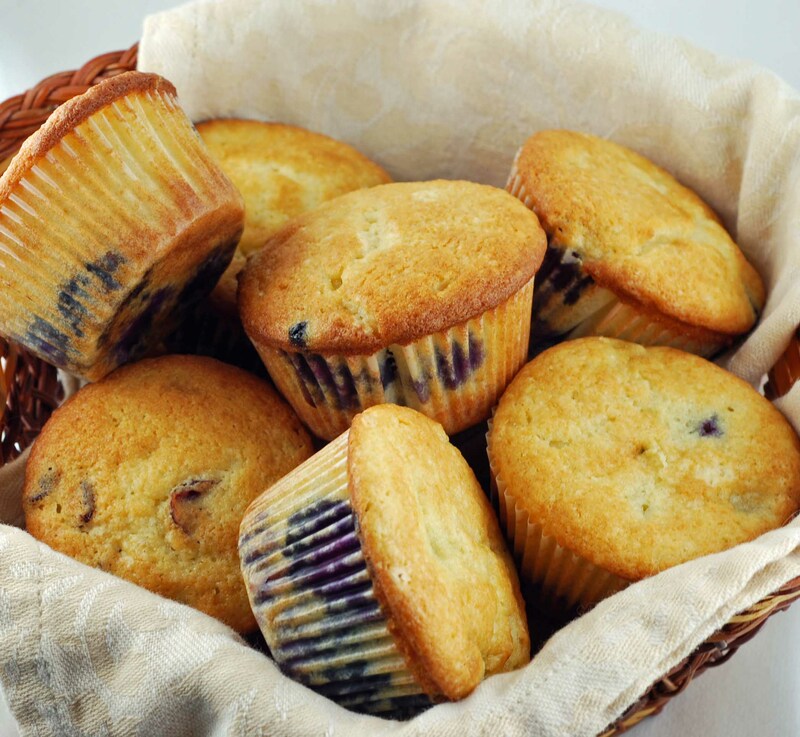 The muffin liner is a must or you’d be fighting the crumbs sticking on the pan! Also, this recipe made WAY more than what it states here. I came out with at least 24 muffins on standard-size muffin pans. Adapted from Barefoot Contessa Family Style. In a separate bowl, sift together the flour, baking powder, baking soda, and salt. With the mixer on low speed add the flour mixture to the batter and beat until just mixed.